Nurses are rushing to join an online movement to pay tribute to a deceased nurse who took her own life after being bullied at work at Seoul Medical Center (SMC). Nurses opened a website to post notes of commemoration. They also plan to hold a memorial rally in February. An online petition on the website of Cheong Wa Dae demands the government save the lives of nurses who are threatened by bullying at work. The online memorial site showed dozens of writings paying tribute to the deceased as of Tuesday. Nurses and nursing students said they would work hard to allow such a tragedy not to occur. Korea Biomedical Review has learned that over 80 nurses gathered to discuss the date and time of the memorial rally. They are also reviewing to join forces with the hospital’s labor union, which had initially revealed the issue of bullying culture among nurses at SMC, as well as the joint response committee for the late nurse Park Seon-wook. The suicide of Park at Asan Medical Center in February last year first shed light on the bullying culture among nurses. 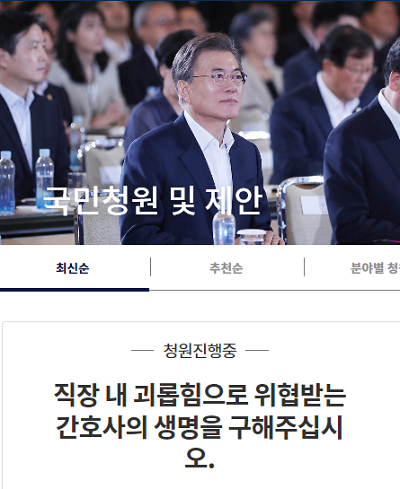 On the online petition site of the presidential office of Cheong Wa Dae, a petitioner demanded the government thoroughly investigate the death of the nurse and root out bullying among nurses. The petition, titled “I demand an accurate investigation over the suicide of a nurse at a hospital,” appeared on Thursday and has garnered 8,945 votes as of Tuesday. The name of the nurse and the hospital have been deleted in the title by the manager of the petition site. Another petition, titled “Please save nurses’ lives threatened by bullying at work,” has won 1,241 votes to date. Emphasizing that a nurse’s safety can ensure the safety of patients, the petitioner urged lawmakers to pass a labor revision bill to prevent bullying at work. The petitioner noted that although the retrospective enforcement of the law would not bring the dead nurse back to life, it could save nurses who were dying. The petitioner also demanded the definition of bullying include emotional distress and asked for clarification in the punishment of the offender. “The bullying by senior nurses against juniors are mostly related to emotional harassment, rather than physical attacks. We should include emotional pain in the definition of bullying at work,” the petitioner said.